VALLEJO, Calif. – The Vallejo Admirals Professional baseball announced Monday the dual signings of pitchers Andin Diaz and Daris Vargas for the 2018 season. Diaz, a native of the Dominican Republic and former Chicago Cubs farmhand, returns to Vallejo after his major contributions to the 2017 Pacific Association championship. Vargas comes to the ballclub from the New York Yankees organization. Admirals fans may remember Diaz for earning the save in the 2017 Pacific Association championship game. His two and two-thirds scoreless innings against Sonoma capped off a successful 12-game run, wherein he notched a 3.26 ERA and a 1-0 won-loss record in 19 and a third innings of work. 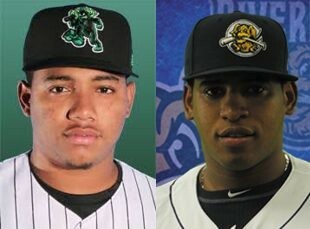 In the Cubs system, Diaz had ascended as high as Short-Season Class-A Eugene of the Northwest League. He hails from the northern coastal town of Nagua in the Dominican Republic. A starter throughout his time in the Yankees system, Dominican native Vargas had reached the full-season Class-A level with Charleston of the South Atlantic League. He posted strong numbers with both Charleston and the Yankees West squad of the Gulf Coast League. Vargas is from the southern coastal city of Azua, 70 miles west of Santo Domingo, the Dominican capital.